A car drives through a flooded street in the Van Nuys section of Los Angeles on Sunday, Jan. 22, 2017. FRESNO, Calif. (KFSN) -- A state of emergency was declared Monday by Gov. 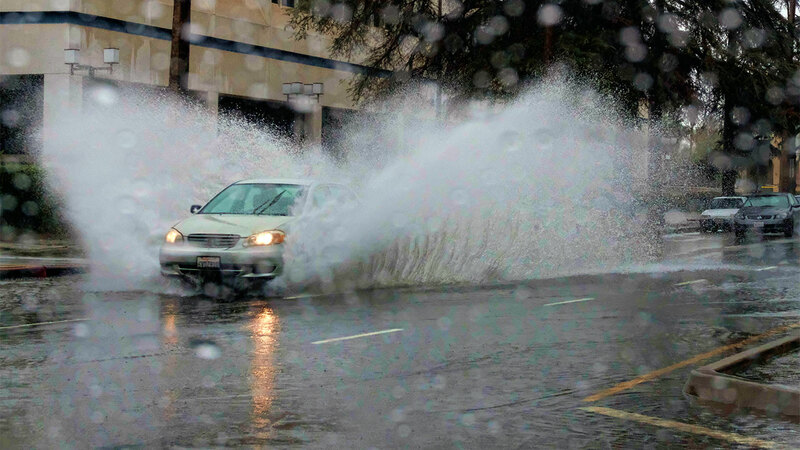 Jerry Brown for dozens of counties across California after a series of storms drenched the state. A press release from Brown's office stated that the proclamation was made to help counties clean up flooding and mudslides as well as repair damaged roadways across California. The state of emergency applies to the majority of the Central Valley, including Fresno, Merced, Tulare, Kings, Madera and Kern Counties. Severe weather flooded multiple highways and caused dozens of rock and mudslides. The Madera County Sheriff's Office issued a mandatory evacuation order for North Fork in early January after heavy rain flooded the mountain community.